I love blueberries for many reasons: they are nutritious – have lots of fiber, vitamins and antioxidants, they are great for the heart and memory, they are grown locally and can be grown sustainably, they freeze well, and they are simply very tasty. Plump, sweet and just a little tart berries are starting to ripen in my backyard, I, however couldn’t wait for my own berries and went a bit blueberry happy at the market last Friday, picking up 5 pints of them – after all I am my mother’s daughter. 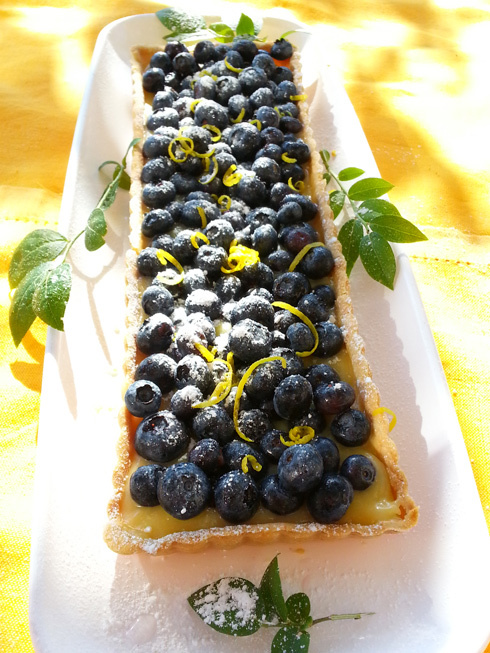 I hosted a little get together last Saturday, and decided that a blueberry & lemon tart would be a perfect last accord to an al fresco meal that I had planned. I like the combination of lemon and blueberries, they create a perfect symbiosis, with lemon highlighting and framing the flavor of the blueberries. The tart is a fairly fast and easy dessert to prepare that it’s also beautiful, light and a treat for the palate. It was a big hit with my guests, as I’m sure will be with yours. You can use a rectangular 13 x 4 inches tart pan(33 x10 cm), or a 9 inch (22 cm) round tart pan. 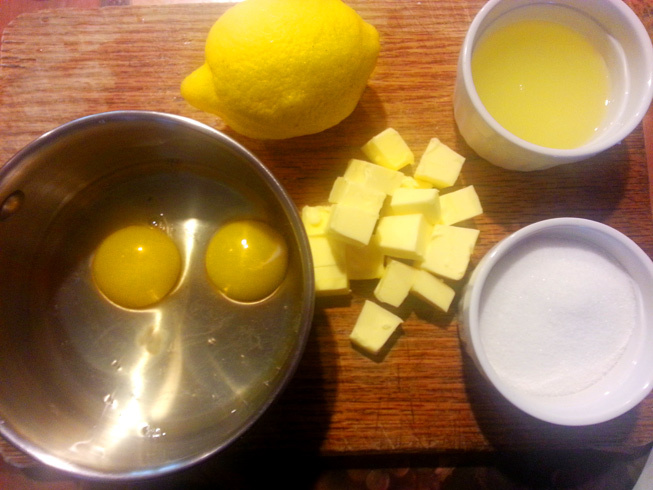 Make the lemon curd filling first. 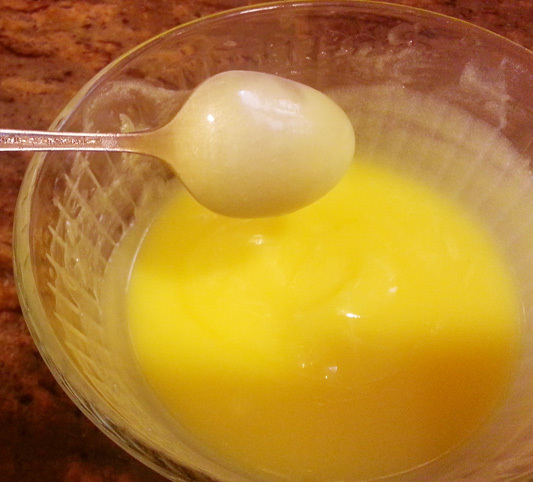 Whisk the eggs and the sugar together in a heat proof bowl. Add the butter and the lemon juice and place over a pan of simmering water, so that the water does not touch the bottom of the bowl. If you have a double boiler, go ahead and use that. Whisk the ingredients together until they are well combined. Continue stirring continuously for about 10 minutes until the mixture thickens and coats the back of the spoon. Remove from heat and cool. Keep covered until needed. 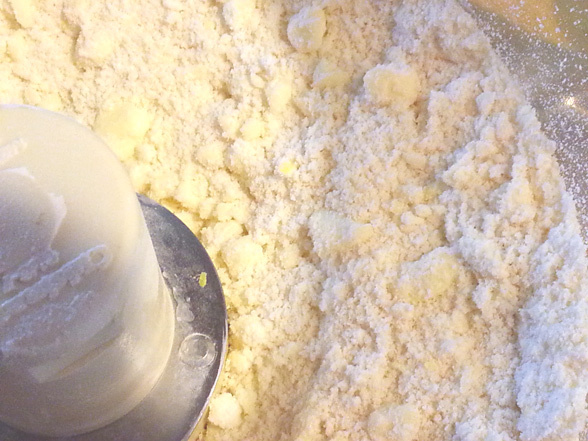 To make the pie dough, put the flour, sugar, salt and butter into a bowl of a food processor with a blade attachment. Process until the mixture resembles fine crumbs. 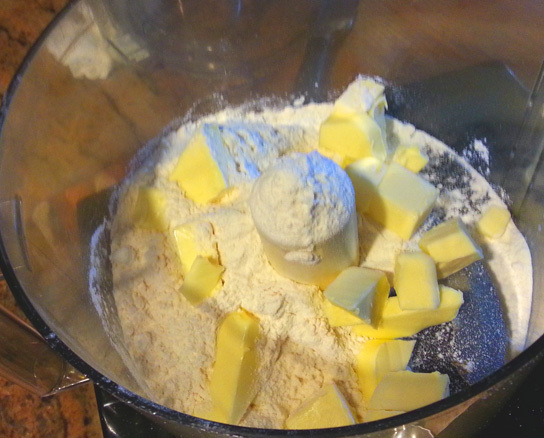 If you don’t have a food processor you could use your knife, fork or pastry knife to cut the butter into the flour. Place the mixture into a large bowl, add egg yolk and start incorporating it into the dough with your hands, adding a cold water tablespoon at a time if necessary, until the dough is formed. Turn the dough out onto a floured surface and roll out about 3 inches(8cm) larger than the tart shell. Carefully lift the dough onto the pan, ( roll the dough on the rolling pin and unroll it on top of the pan) and press to fit. Roll the rolling pin over the tart pan to trim the excess dough and neaten the edges. Remove the tart shell from the refrigerator and place it into the oven. Bake for 15 minutes blind(with pie weights) in the middle of the preheated oven. Then remove the beans and parchment, if the bottom of the shell still soft , prick it with fork. Return to oven for another 10 minutes and cool. Spoon the lemon curd into the tart shell, add blueberries on top, sift with confectioners sugar and decorate with lemon zest. Alternately you can poach the blueberries in cassis until they are almost bursting, cool and add to lemon curd.